There is just something about seeing skewered chunks of meat slowly cooking over an open fire; we love the charred aroma of caramelised fat. Have we got you salivating yet? If we have, then it’s time to unleash your primitive side and have yourself a unique, meat-driven feast at The Hungry Caveman. 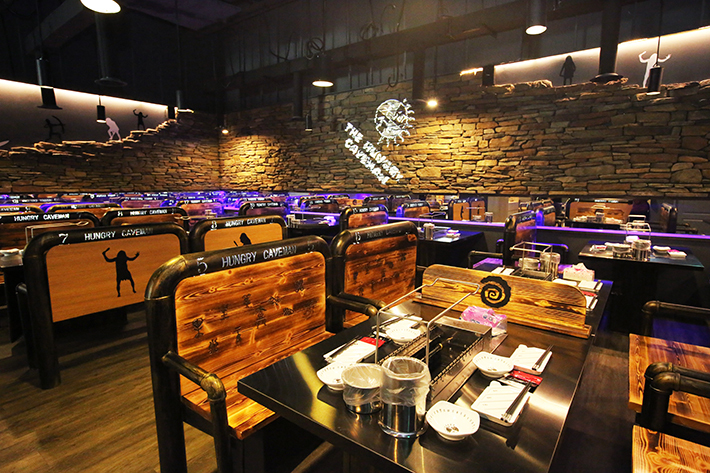 Our readers can quote ‘ladyironchef’ upon making your reservation to enjoy 1-for-1 signature meat skewers at The Hungry Caveman from 12 to 28 Feb 2018. Read more details at the end of the post. Easy to grill, hold, eat and discard, the food skewer represents a brilliant bit of prehistoric dining and as its name suggests, The Hungry Caveman is all about hands-on cooking and rustic eating. Better yet, instead of having servers on standby to assist you (which they will upon request!) diners will have the chance to experience how cooking over an open flame feels like. The process of grilling here is fairly easy. 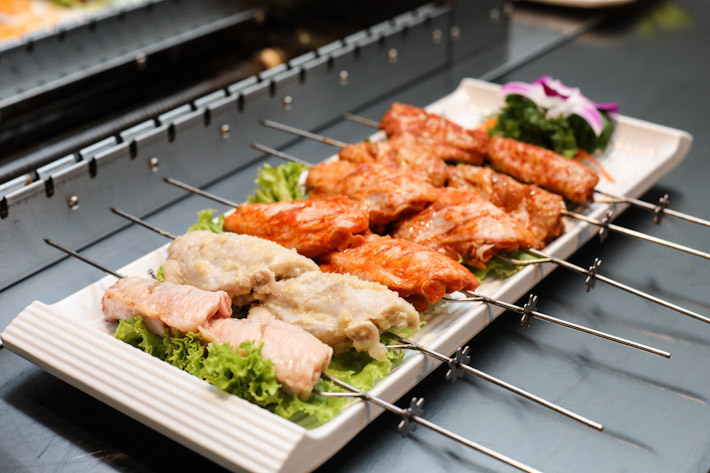 Simply lower your skewer onto the grill and align the pinion gear that’s on the metal skewer onto the moving rack gear to allow your food to rotate and cook evenly. As we mentioned earlier, every country has its own version of meat on a stick, but in Beijing, China, you’re likely to find lamb as the predominant protein of choice when it comes to skewered meat. Here at Singapore’s The Hungry Caveman, the Signature Lamb Skewer (S$2.20 per skewer) is, too, a must-try. Rubbed generously with chilli peppers and cumin, the lamb—that had a perfect meat-to-fat ratio—was juicy and incredibly flavourful. You get prominent notes from the cumin followed by a mild kick at the back of your tongue from the chilli peppers—both of which did well to round out the distinctive lamb flavour beautifully. To contrast the gamy lamb, we highly recommend you to order their AUS Grain Fed Beef Skewer (S$2.60 per skewer) that not only boasts a deep, beefy flavour but is also distinctive in terms of sheer tenderness. Where chicken wings are concerned, you will find no shortage of it here. Choose from a selection of marinated Chicken Mid-Joint Wings (S$2.80 per skewer) that come in a variety of flavours such as savoury Xiang La, spicy Cajun, kid-friendly Honey Glazed as well their perspiration-inducing Extreme Spicy. If like us, your love for seafood is unfathomable, then you will definitely be impressed by their range of seafood options. 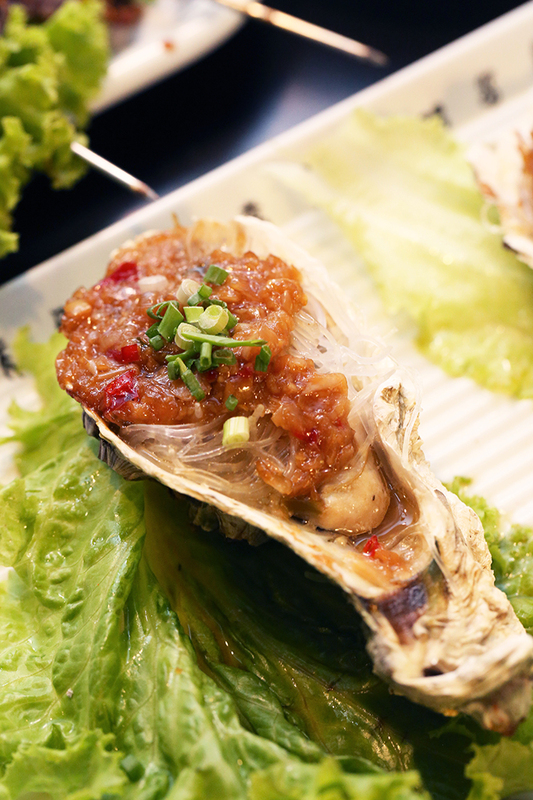 What we love most about The Hungry Caveman is their massive range that comprises fresh marinated seafood and even ones that come already grilled and ready to eat immediately. 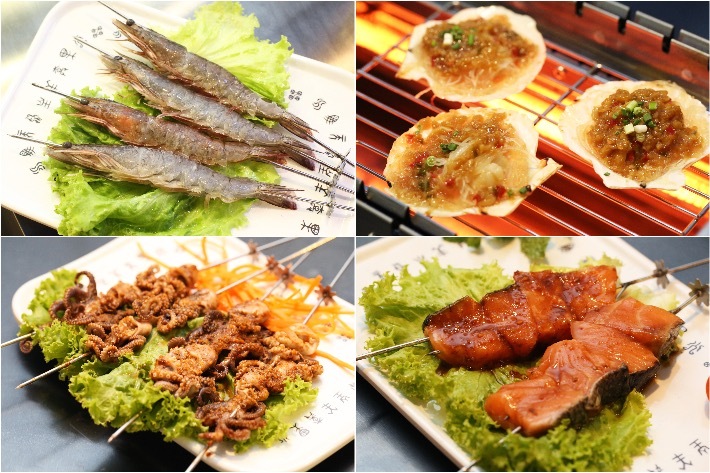 Some of our favourites include the Spear-The-Salmon Skewer (S$3.80 per skewer), Premium Scallop with Garlic Vermicelli (S$4.80 per piece), Grilled Ink Fish Skewer (S$2.60 per skewer) and not forgetting, the slightly pricey but oh-so-worth-it, Grilled Oysters (S$7.80 per piece). 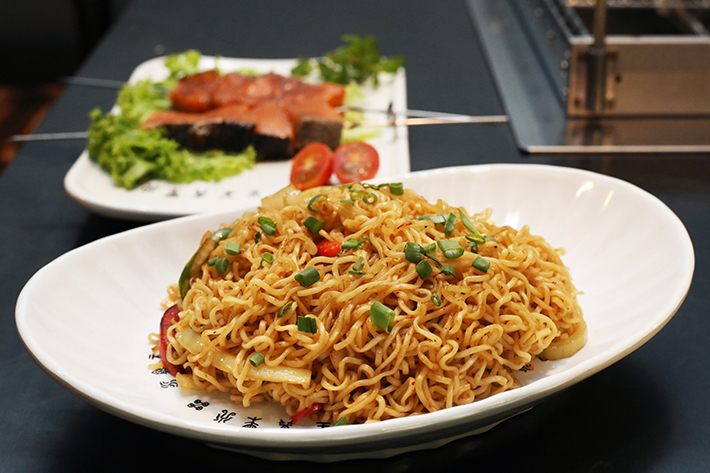 Priced at an affordable S$8.80, the Special Fried Noodles is ideal for sharing between 2 or even 3 diners and is quite the tummy filler. Fried with a simple mix of onions, bell peppers and a light seasoning to bring it all together, this noodle dish makes for a great accompaniment to the heavier, meatier dishes. 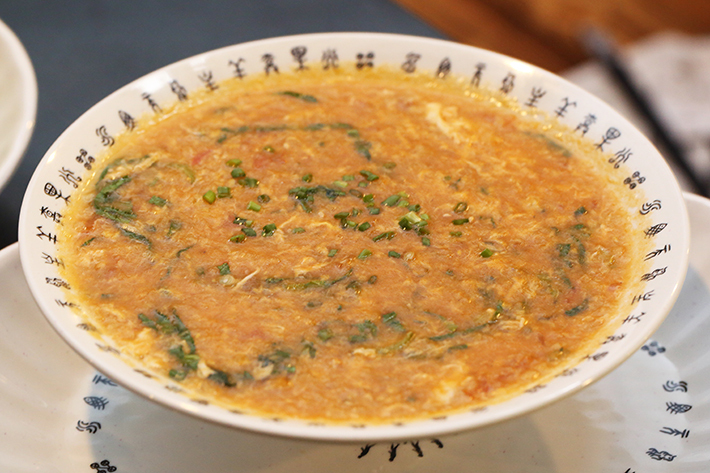 Ge da soup is a very common household staple in northern China. Essentially a thick soup comprising tomatoes, finely diced vegetables, a beaten egg and ge da (noodle bits), this soup is as comforting as it is tasty. Similar to gnocchi, the ge da is chewy and adds a nice texture to the soup. The soup, on the other hand, carries with it, nuances of sweet tomato that is well complemented by the rich egg that thickens it and gives it a nice silky texture. 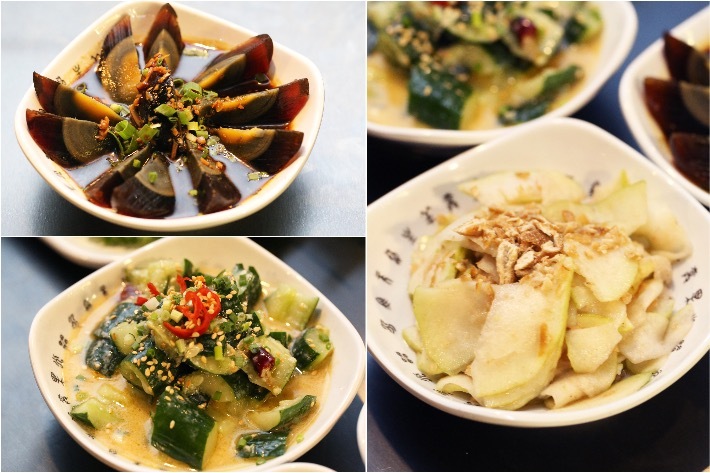 For S$7.50 a bowl, we dare say that this is something we would make a deliberate trip down to The Hungry Caveman for. 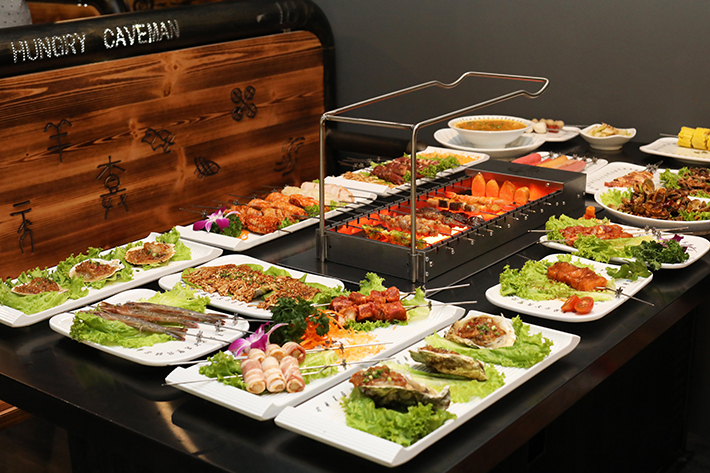 In addition to grilled skewers, the restaurant also serves up an array of cold dishes—perfect to snack on while you wait for your food to be done the cooking. We had the Century Egg with Marinated Ginger (S$5.95), the Cucumber with Mash Garlic (S$5.95) as well as the Guava with Dried Orange Skin (S$4.95). While we enjoyed all of them, we have to admit that the latter was the ultimate standout. Sliced thin and soaked in a sweet, sour and salty brine consisting of dried orange peel, this seemingly ordinary dish is the perfect palate cleanser and is also incredibly refreshing. The medley of tastes coupled with the fresh guava counteracts the barbecue notes really well. 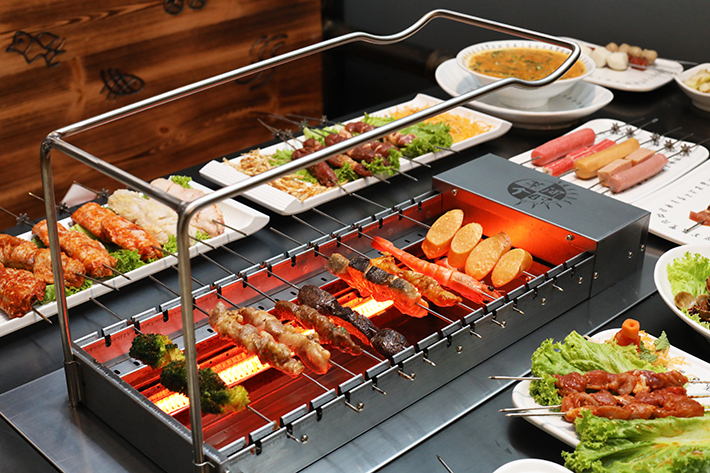 The 1-For-1 promotion is available for up to 5 skewers per diner. 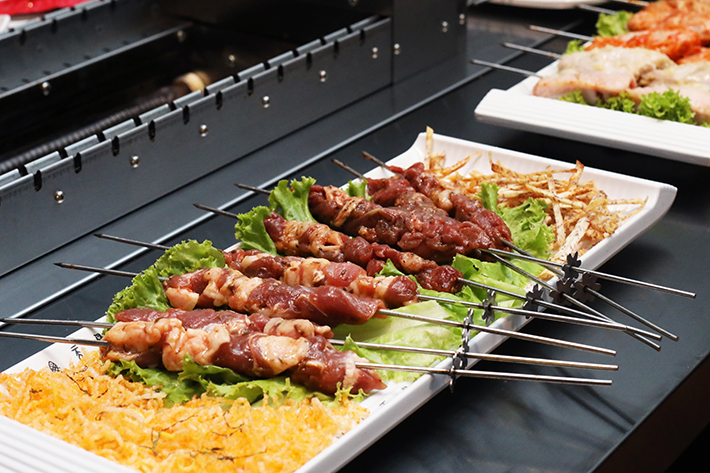 Each diner may choose up to any 5 skewers within the four types of skewers and get another 5 exact skewers for free! Promo is not valid in conjunction with other promotion, discounts or vouchers. The Hungry Caveman reserves the right to amend the terms and conditions at any time without prior notice. This post is brought to you by The Hungry Caveman. The Hungry Cavemen is not the first to have Automated BBQ Skewers. Kko Chi Bar Already did that.